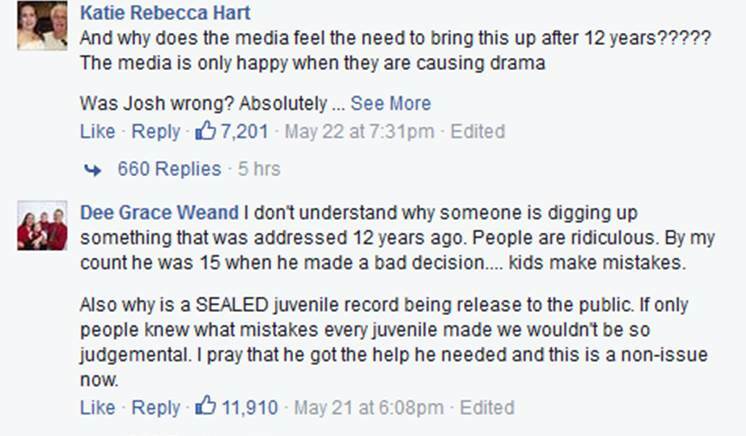 Duggar Update: Josh Duggar Apologizes, His Police Records are Destroyed and Mike Huckabee is ALL Team Josh! - T.V.S.T. The fallout from the scandal has been swift so all that Josh could really do is apologize. In fact, as we are quickly learning, until you admit everything and take full responsibility the clock of public forgiveness doesn’t even begin to start ticking. Josh knows this all too well and nailed the first two steps in regaining public approval: Step 1 – He issued a prompt apology and Step 2 – he took 100% accountability with no excuses. Twelve years ago, as a young teenager, I acted inexcusably for which I am extremely sorry and deeply regret. I hurt others, including my family and close friends. I confessed this to my parents who took several steps to help me address the situation. We spoke with the authorities where I confessed my wrongdoing, and my parents arranged for me and those affected by my actions to receive counseling. I understood that if I continued down this wrong road that I would end up ruining my life. I would do anything to go back to those teen years and take different actions. I sought forgiveness from those I had wronged and asked Christ to forgive me and come into my life. In my life today, I am so very thankful for God’s grace, mercy and redemption. 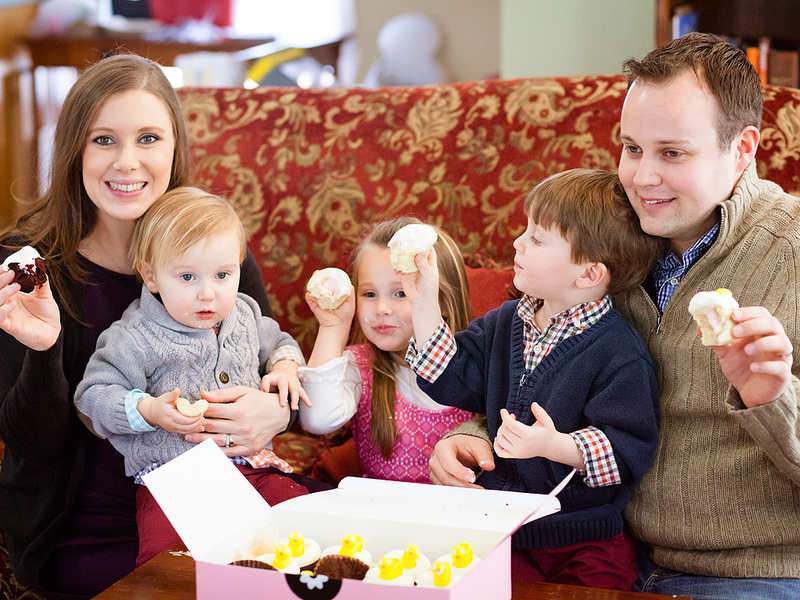 Josh has also removed himself from his position at the Family Research Council. He has been the face of the FRC at rallies against LGBT equality events often touting his rhetoric of how the LGBT lifestyle is a threat to children. The FRC even has a published report claiming that homosexual males molest boys at rates grossly disproportionate to the rate that heterosexual men molest girls. 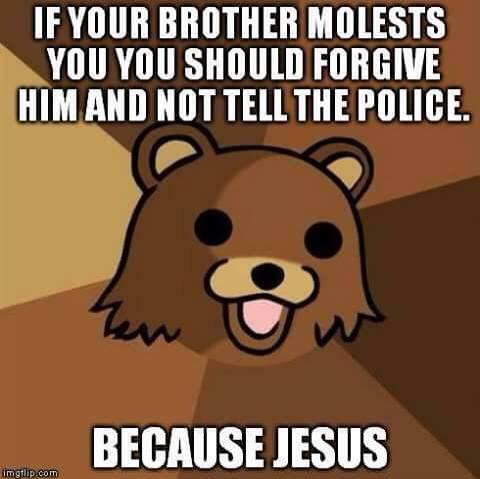 Of course we know now in 2015, that men who molest boys are not necessarily gay, just one of many fallacies that the FRC is known for promoting. They have released a statement on their website stating that the decision for Josh to resign was his own. THE POLICE RECORDS DESTROYED? WHY? The judge ordered us yesterday to expunge that record. As far as the Springdale Police Department is concerned, this report doesn’t exist. I’m sure if the child that was not one of the sisters were their daughter they would be just a little angrier at Josh and his parents Jim Bob and Michelle for covering up the incident. 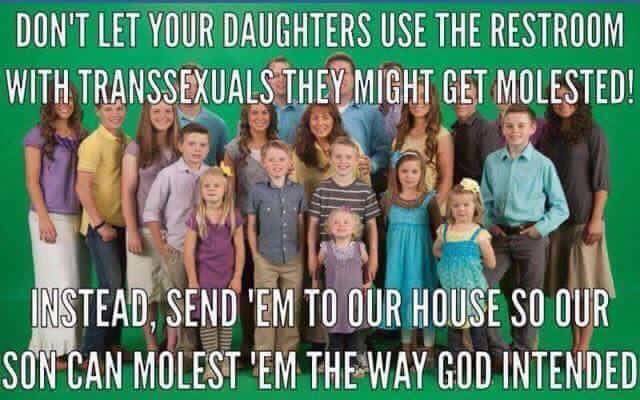 The Duggar family are the wet dreams of right wingers and still have support from the Arkansas Republicans. 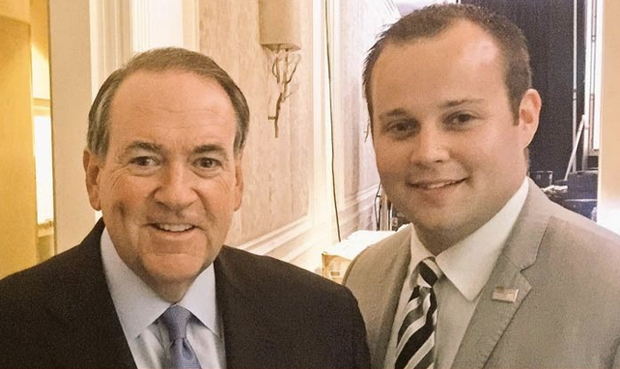 Earlier this month before all the drama, the Duggar family showed their support for Mike Huckabee at an event to kick off his presidential campaign. Huckabee returned the favor with a message of “somewhat” support. 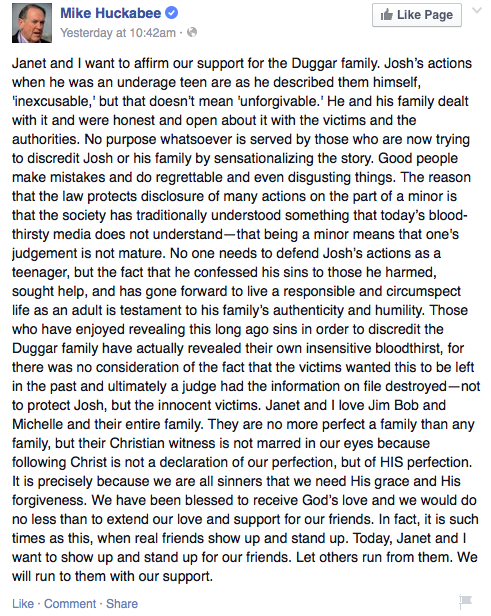 Those who have enjoyed revealing this long ago sins in order to discredit the Duggar family have actually revealed their own insensitive bloodthirst, for there was no consideration of the fact that the victims wanted this to be left in the past and ultimately a judge had the information on file destroyed_not to protect Josh, but the innocent victims. Ok, not too bad I thought. That was the first message I read. Then I went to his Facebook page and read the full message. This has gone from “somewhat” to “Full Overwhelming” support. 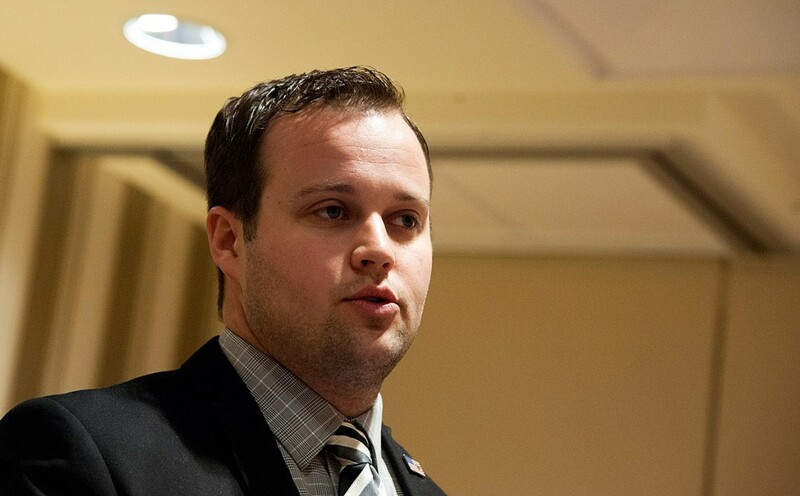 Child molestation is a crime even amongst criminals and the Duggar family is a small piece of American history. For Mike Huckabee to support them with even a vague defense probably has done his presidential campaign more harm then necessary. However, in my opinion this message posted on Facebook has just ended his bid. No one wants a President that thinks that this is not a disgusting an appalling act. Huckabee might actually think that this is a disgusting act (both covering it up, and the act itself) but that is not the perception he has given and we know the public’s perception quickly becomes their reality: Cosby is guilty, Kim Kardashian is the devil, and George Clooney is God (…but Cosby is probably guilty). 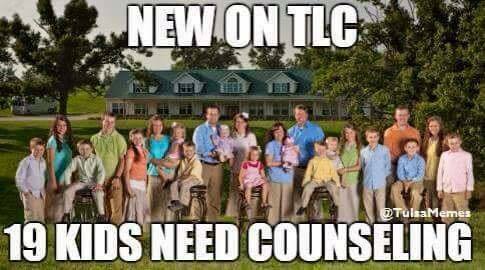 TLC has officially pulled the show (at least we think so, there is some wavering), Josh is out of work and we will never know the true damage of this travesty that was covered up by this ultra judgmental, bible toting family. If they would have exposed Josh, right when it happened, this story would have been a non issue. In fact they would have been heroes and would have shown millions of Americans who are victims and families of victims, how to properly deal with these types of issues grounded in he word of God. They could show how their faith gets them through it by making the hard decisions and doing the right thing. Instead they used God as a cover for their wrong doing. Not Cool.